Dinner ideas for two can be difficult to navigate when you have limited diets. 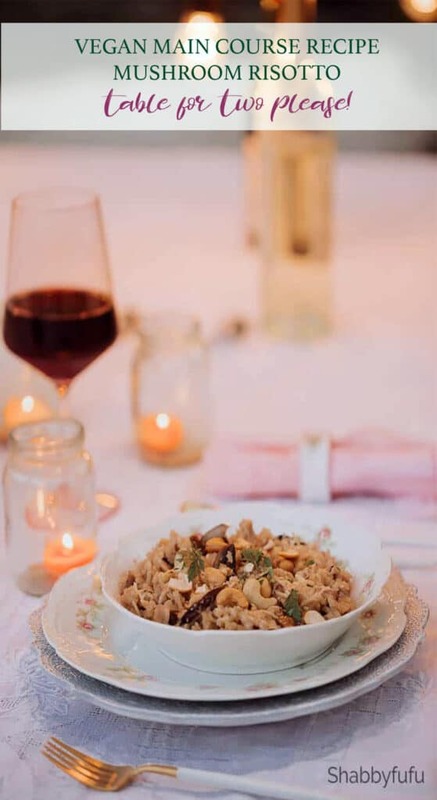 Here is an easy vegan dish perfect for Valentines Day dinner that might speak your love language! In the last year my diet has radically changed. I’ve been going to a naturopathic physical to determine the causes of migraines that I was pretty sure was food related. After about 5,632 tubes of blood drawn (or…what felt like it;-) and ALCAT testing it showed very high levels of inflammation, which can cause many chronic health problems. I have been determined to get healthier and am still on that path in 2019. 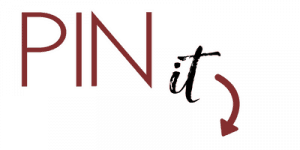 I wrote about which supplements I now take >IN THIS POST< and have been gluten and dairy free for at least 6 months or so now. Feeling so much better, and now my husband and I also incorporate a more vegan lifestyle. 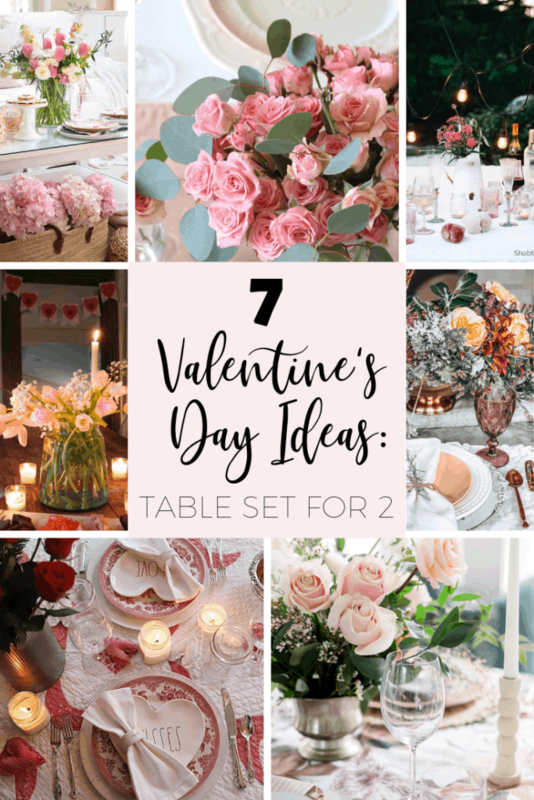 That leads me to today’s post with dinner ideas for two and this one is completely romantic, just in time for Valentines Day! 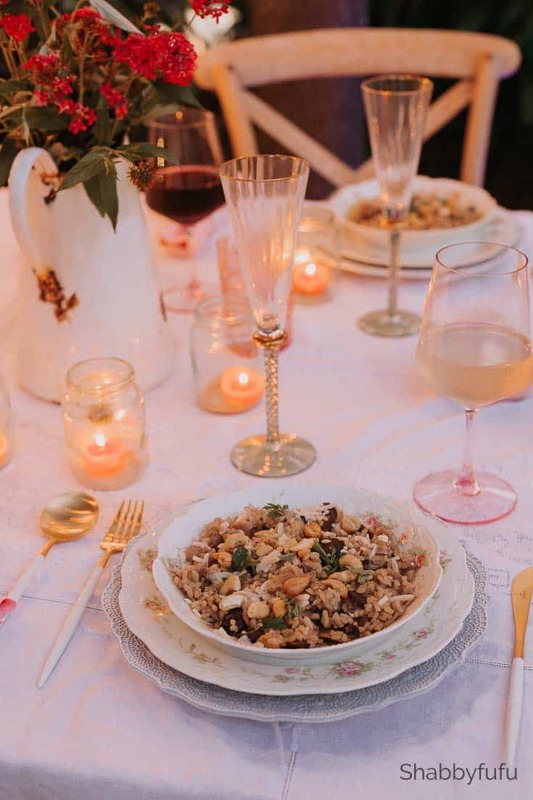 First the recipe and then comes the table setting…and it’s a pretty one celebrating outdoors. Living in Miami it’s how we live in winter and it’s too short of a season not to al fresco it often! On tonight’s menu is Risotto With Mushrooms And Vegan Cheese. 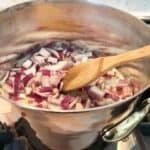 Creamy dishes are some of my favorites and risotto speaks my love language! 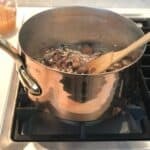 You can make risotto as a side dish or as I often do, as a main course. When you need dinner ideas for two, think about risotto with shrimp or scallops and it’s hearty and delectable. 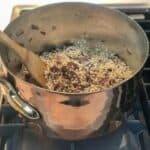 Here is my recipe for risotto, which is easy to make, vegan and very filling. 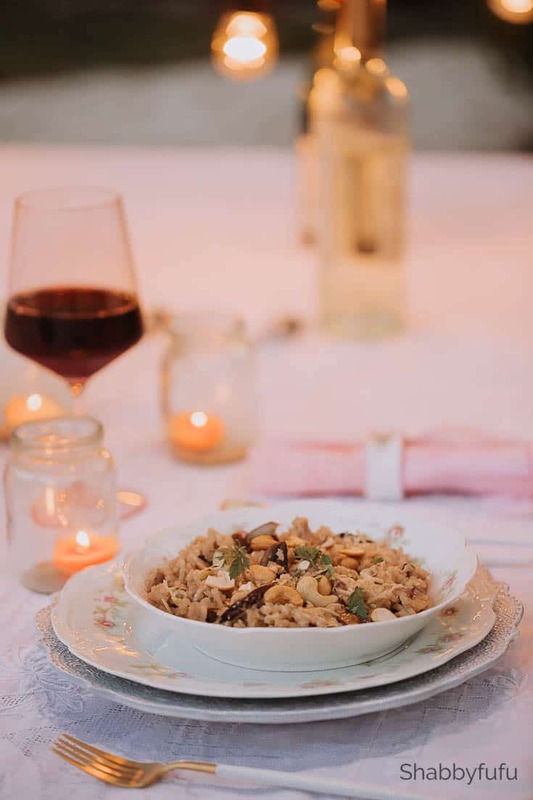 An easy vegan dish, this risotto for two is dairy and gluten free and will satisfy your appetite for creamy comfort food. Saute onion in oil and butter for a minute or two. Add sliced mushrooms and cook until tender, about 3 or 4 minutes. Add rice, stirring for about 3 minutes to slightly toast. Stir in remaining broth one cup at a time, cooking and stirring until liquid is absorbed before adding the next cup. When all liquid is absorbed, fluff with fork and plate. Sprinkle vegan cheese shreds over plate and microwave for 60 seconds to melt. If desired, add cashews to the top for crunch. Serve as a main or side dish and add grilled vegetables for extra nutrition, or grilled shrimp or scallops for protein. And now the romantic part…you know, for Valentines Day! Here is how the dish looked and it was truly delicious to the point of intoxicating! I’m not talking just the wine, but this risotto dish is that good. I’m always cooking for two now that the kids are grown. When I have a few dinner ideas for two, my husband is always very cooperative and will try anything. He’s also game for helping me drag our dinner to the various parts of our garden to eat outdoors. 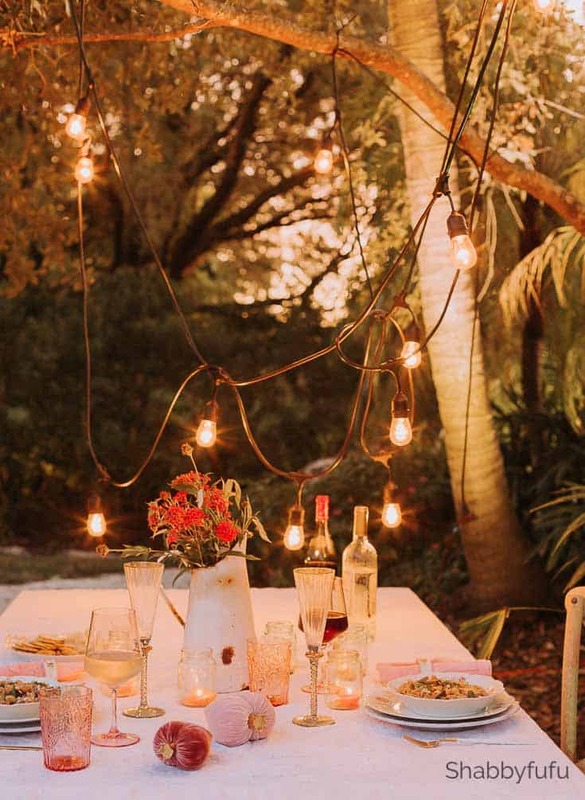 What could be better than dining under the stars, the moon and the twinkle lights? This is one of three outdoor table areas that we have and it’s picturesque amongst the palms and oaks. 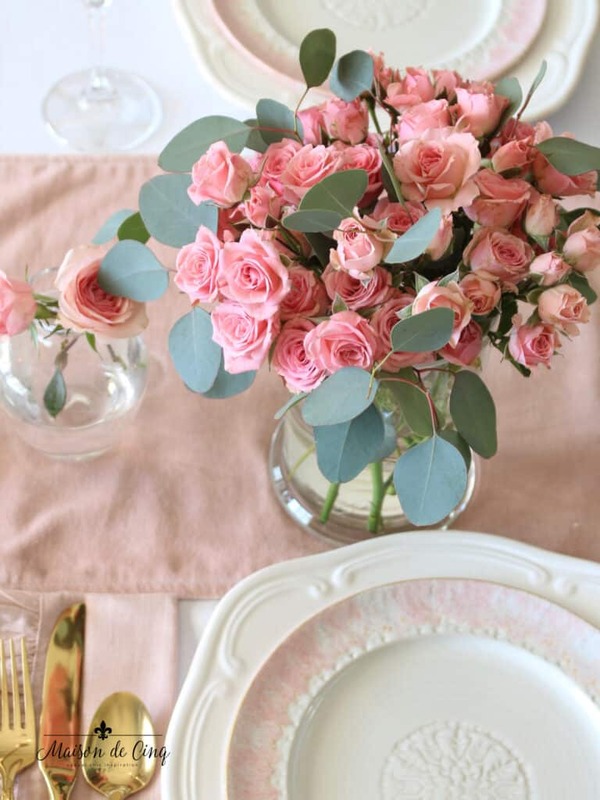 For this early Valentines Day inspired dinner I covered the well worn table with a blush pink vintage tablecloth. The table was set pretty simply with vintage roses china, an old French enamelware pitcher with cuttings from the garden and candles in old French yogurt jars. I snapped the photos below before we sat down to eat. A couple of Valentines Day Velvet Hearts with gold crowns. They are ever so pretty and you’ll find them RIGHT HERE . To order some of these for your VALENTINES DAY, just use my code SFHEARTS for free shipping through January 31st. I also served some crackers and cheese to my husband, who is not gluten and dairy free. I had cauliflower crackers that are REALLY GOOD and you can find them HERE. Perfect for those of you doing KETO and they are gluten free for me! I had mine with a dip that was made from roasting a whole head of elephant garlic wrapped in foil in a 450 degree oven for 1/2 hour. Then just squish out the cooked garlic (once cool) and it’s a yummy spread in it’s own right. Please let me know if you have any questions and visit my talented friends who are sharing today below! Oh wow. I love these ideas so much! 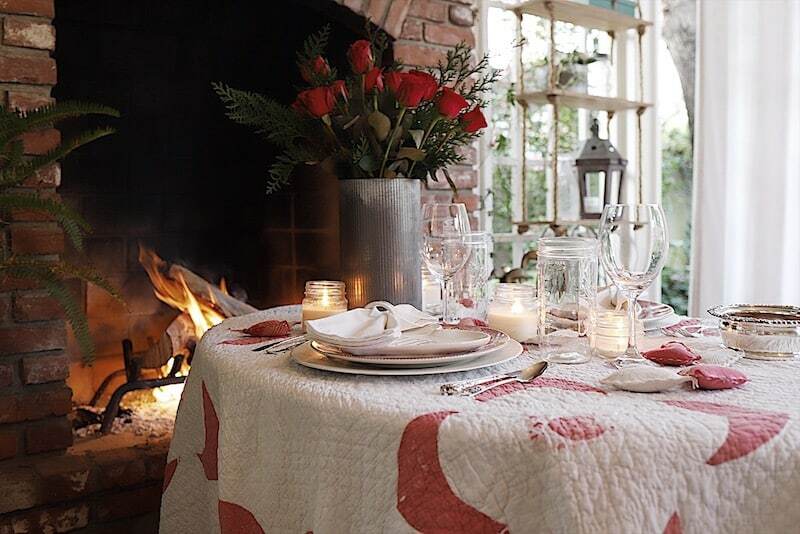 Being together on Valentine’s Day is the best gift, but these romantic settings are a close second. Love it! This is great for dinner for two and looks really delicious. Dinner for one would work just as well and be just as delicious. It’s fun checking out all the different ideas for Valentine’s Day. I love your vegan dinner idea and your table decor is so romantic. 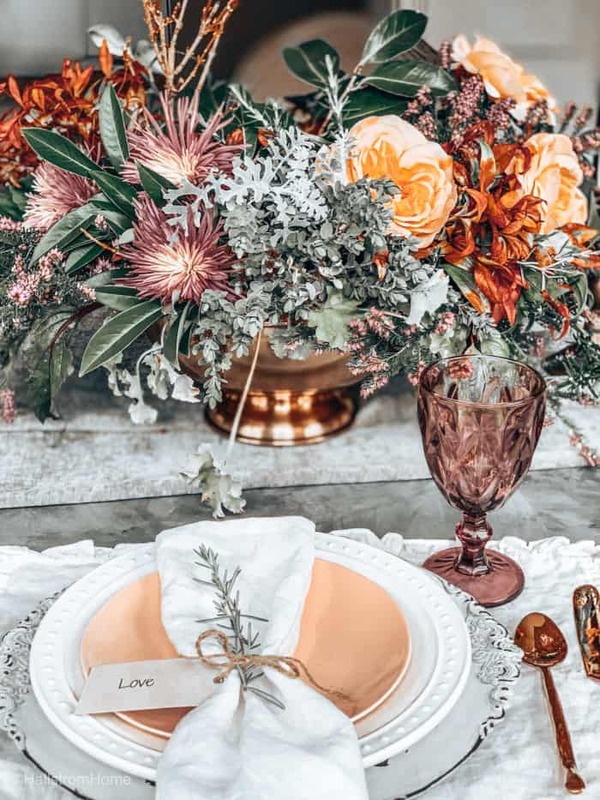 Your table setting is absolutely gorgeous! I think it is romantic. The dinner ideas are perfect for vegans. Sharing with a friend. Yum, I would love this. I hope my husband will cook for me 😉 Ha. But what usually happens is we order pizza because no one wants to cook. We don’t celebrate Valentine’s Day, so it’s just another day for us. I do love it when he cooks for me or better yet – we cook together. 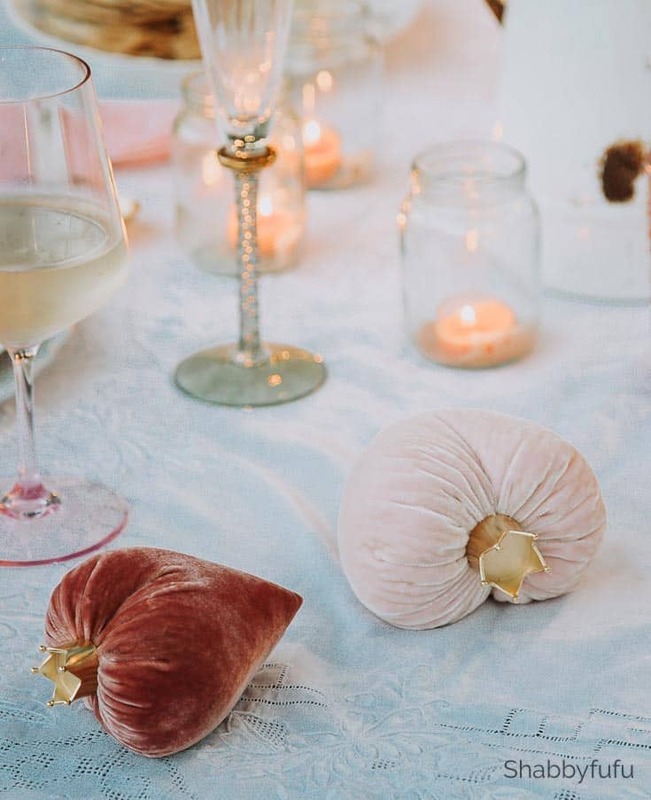 truly love all of these great ideas my friend- just being together is enough for me esp with no kids if we can ha but i may incorporate some of these this year! That sounds like a wonderfully romantic meal. I love how you set up the table and the food looks absolutely delicious. 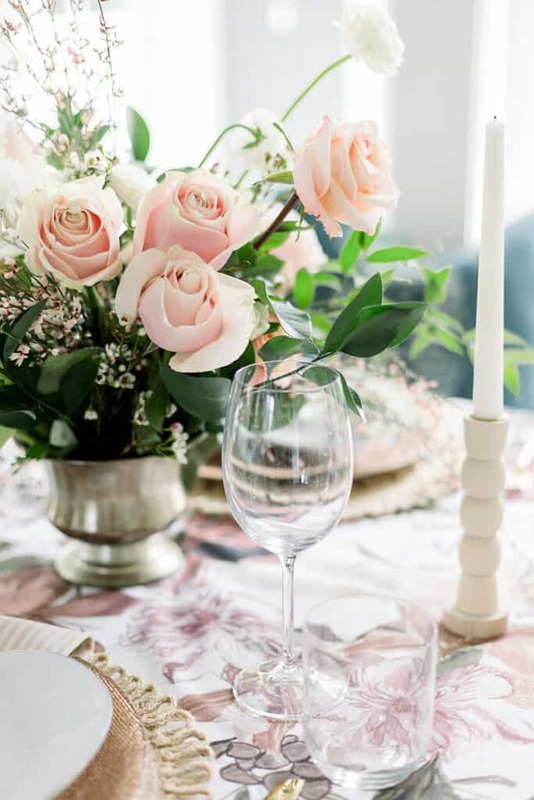 These table settings are stunning. 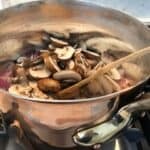 I love risotto and it goes so good with mushrooms. I don’t think I’ve ever had it as the main dish though. Always a side. Bookmarking this recipe. What some absolutely delicious ideas! I am really trying to perhaps try more vegan ideas this year so I will add these two to the list, even if not at Valentines. I can’t believe how quickly Valentine’s Day is approaching. My husband and I have not even made plans yet. I really need to get to planning! This is such a great option! I’m planning a dinner date with my hubby and I think I’ll make this. These are all great vegan options for Valentines Day, or any special meal for two! Thanks for the meal inspiration! 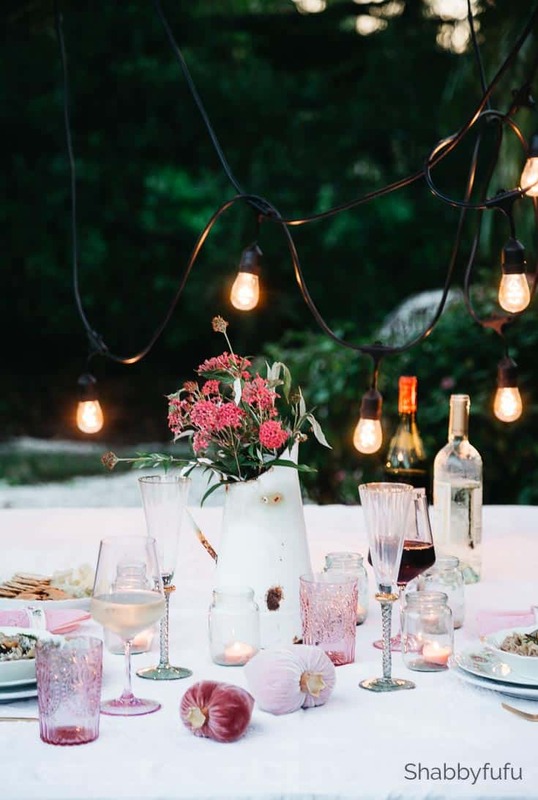 Your table setting and back yard are very romantic! This looks delicious and perfect for anyone (without a food allergy to the ingredients.) I will be making this soon! 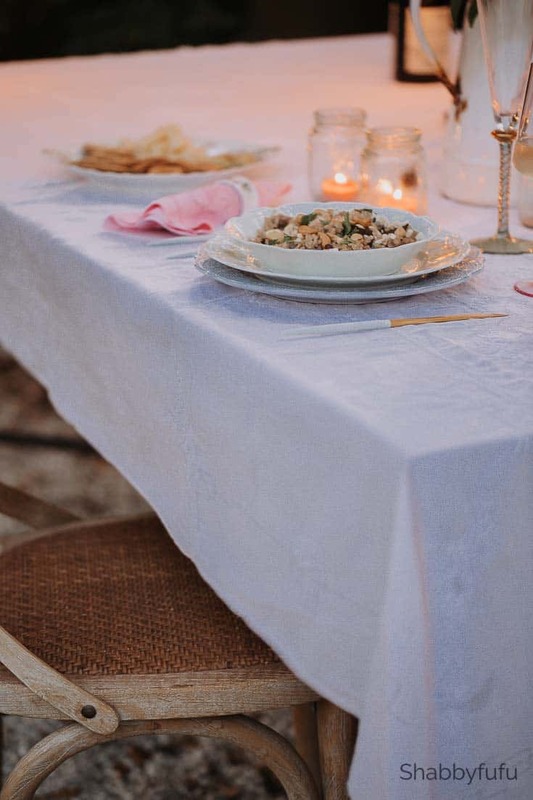 I always love seeing your lovely tables set outdoors Janet – so pretty! And I didn’t know you were gluten free! How did I not know that?! My mom has celiac disease so we are well-versed here in the gluten free world. I ‘ll have to tell her about your risotto – it looks delicious! This is such a perfect place to celebrate this coming valentine day. 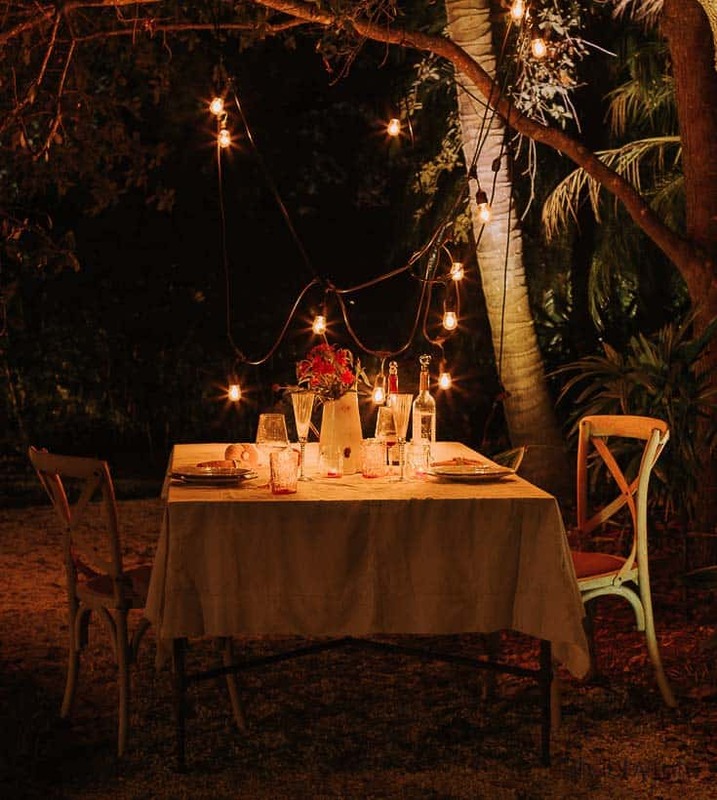 A sweet and romantic date. 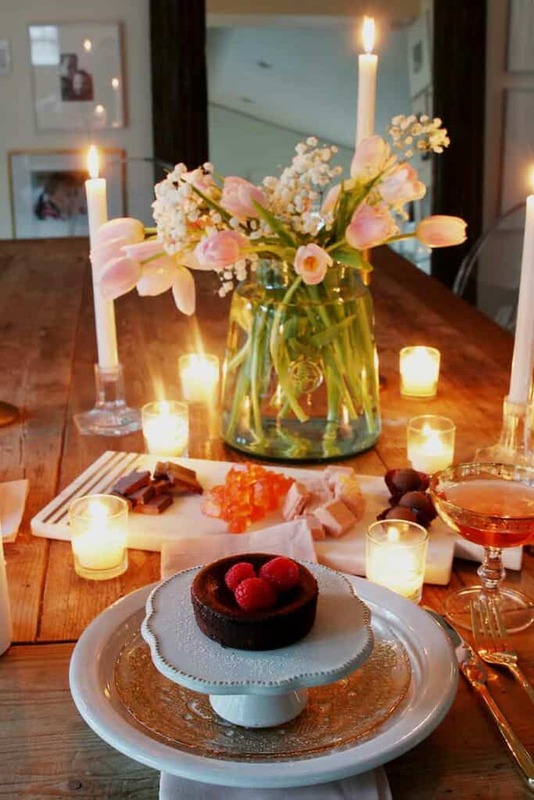 This is perfect for hubby and I. I usually make a special dinner for him because it is also his birthday. The hubs and I were just talking about Valentine’s Day the other day. We still haven’t decided where to go or what to do so thank you for all these romantic ideas. This sounds like wonderful idea, That Mushroom risotto sounds really yum. Table setting is really nice. Going to best romantic dinner. YUM! My goodness I need to try this recipe! We’ve been doing a plant-based diet too and I’m always looking for yummy options. Thank you my friend!